Play Baccarat in the best online casinos! Baccarat is played from a six-deck or an eight-deck shoe. Two hands are dealt, and the higher hand wins. You can bet on either hand to win. One hand is called Banker and the other called Player, but that's purely arbitrary, and you can bet on either hand. The Banker hand has nothing to do with the casino, and the Player hand has nothing to do with you. They might as well call the hands Hand 1 and Hand 2. Note also that there's only one Player hand dealt no matter how many players there are, because the "Player" hand isn't really the player's hand, it's just one of the choices you can bet on. All face cards and 10s have no value. Cards less than 10 are counted at face value, Aces are worth 1. Suits don't matter. Only single digit values are valid. 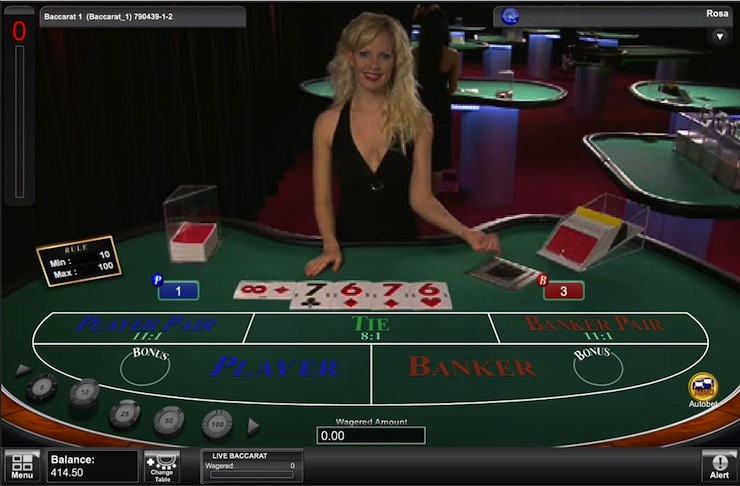 To start, the players bet either on Banker, Player, or Tie. The card dealer gives two cards each; first to the player and then the banker. The object of the game is to bet on the hand that you think will have the highest total value. Betting on Tie isn`t beneficial for the player, so you should bet either on Banker, or Player. Baccarat is appealing because there's no strategy to learn. Most games with a low edge require you to learn some strategy. But with Baccarat, you get the some low edge no matter what, because the only decisions you make are how much to bet and which of the two low-edge hands you want to bet on, Player or Banker. The only way to screw this up is to make the Tie bet which carries a high edge.